first book that I published, but it was my first concept for a book that made it all the way to publication. 2. Are you currently working on a project, and if so, can you tell us anything about it? I’m currently working on three projects. One of them is the final and fifth installment of the River Road set of the Haunted Hearts Series, The Sweet Madness of Honeysuckle. 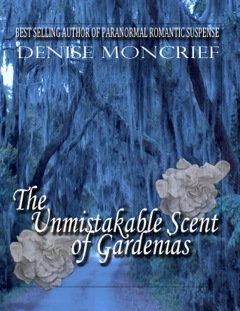 Today’s highlighted book, The Unmistakable Scent of Gardenias is the first book in the set. In Honeysuckle, Tricia is a woman who has had a run in with one of the crime families in New Orleans. She escaped from them once but is afraid they will find her again. She’s hiding out in a small town, working in a bar on the edge of the swamp. The new bouncer at the bar is a has-been ex-cop with a sketchy past and a bum leg. Together they become entangled in the ghost story that has been the story arc for the whole River Road set. 3. What is your favorite writing snack? Coffee. All I need is coffee. 4. If you could have dinner with any of your characters, which ones would you choose? Why? What food would you serve? The River Road series is set in south Louisiana, a part of the world thatI am somewhat familiar with. I’ve always been fond of the culture and flavor of the area. I would want to get the ensemble of characters from the River Road set together and have a crawfish boil. That is very Louisiana. 5. Did you learn anything from writing your book and what was it? My husband and I took a few trips to south Louisiana while I was writing this series. I’ve always loved the culture and flavor of the area. I took a lot of pictures and took some time to absorb the feel of the area. Hopefully, I’ve been able to describe some of what I absorbed. I think any little bit of authenticity that can be added to a setting or a plot point makes a story richer. The time a time for an author to use her imagination, and there are other times when the scene being described should be realistic. 6. How do you relax, or what do you enjoy doing when you are not writing? More than anything, I enjoy being with my family. That’s become especially important to me since I’ve become an empty nester. I confess I have a terrible Netflix and Hulu bingeing habit. My husband did a good thing for me for my last birthday and bought me a new guitar. So lately, I’ve shifted some of spare time to getting back into playing the guitar again. 7. What is your largest unfulfilled dream, and what are you doing to reach it? I had to think about this question for a long time. There have been a few dreams of mine that have come and gone. Sometimes, you have to let a dream go so a bigger or better dream can take its place. I always wanted to sing for an audience. That didn’t happen the way I wanted it to. So I set that dream aside and concentrated on something else. Writing took its place with a different set of goals. I’m living the dream. I feel like my writing career is already successful. So I don’t think I hold any dreams that haven’t been fulfilled. 8. What do you fear most? Nothing gets to me more than being forgotten, unheard, or overlooked. So all of my fears center around being abandoned. 9. What advice would you give someone who wants to write a book some day? Two pieces of advice that I read over and over are only good advice if you go beyond the surface of their basic meaning. Write what you know – This means that you should be familiar with your subject. If you want to write about something you don’t know much about, expand what you know on the subject. Don’t let a lack of knowledge stop you from exploring new interests in your writing. Write every day – This means that you should practice writing every day. Like anything done well, you have to keep doing it or you’ll lose your edge. But this doesn’t just mean accumulating words in a manuscript. Let everything you experience in your life become part of your writing process. Write even when you aren’t writing words.